This is the best source for deciphering your rejection letter that I’ve come across so far. Check out Susan Litman’s Editor Chat Transcript “Let’s talk rejections” from eHarlequin. It’s that time of year! However, if you’re like me, you’re probably still in denial that it’s even November. For anyone who doesn’t know NaNoWriMo stands for National Novel Writing Month and it’s basically when the entire writing community collectively loses their minds and decides to write 50,000 words by the end of November. That’s 50K in 30 days. It’s not as scary as it sounds. ﻿﻿﻿﻿﻿If you want to know more or if you want to sign up at the official site, click here. Other sites, including Harlequin also do their own NaNoWriMo but as far as I know the Harlequin link isn’t up yet. ﻿﻿﻿﻿﻿﻿﻿﻿﻿﻿﻿﻿﻿﻿﻿﻿Now I’m not sure whether or not I’ll be joining in this year because I’d only be able to start halfway through the month, which would make it NaNoWriFo (National Novel Writing Fortnight). But this post isn’t about me. It’s about YOU. I want to know who’s participating this year! So, if you do decide to participate you can get the official blog badges for 2010 here. You’ve got a little over a week to decide whether or not you need to stock up on Red Bull and make sure you let me know so I can wave my pom poms in your direction! Perhaps I'll replace our New Voices Wall of Fame with our NaNoers? When the tickets for the Barbara Hannay workshop this weekend still hadn’t turned up yesterday I made a call to see if something had happened. Something has happened, or perhaps not happened. We aren’t on the list. Apparently we just missed out, so the order went through, hence my lovely printed confirmation, but it must have been just seconds after someone else’s order, and the payment was then reversed. It’s a rather disappointing discovery and you’ve just got to love technology when something like this happens. I suppose the lesson is to obsessively compulsively check your bank account to make sure that your confirmation is in fact a confirmation? Where’s an IT genius when you need them? Before I entered the New Voices comp I made the decision that it was my last one. Actually, I think I said that about a competition two years ago but NV was such an interesting concept I couldn’t help myself. Although submitting to the world turned out to be akin to having to run down a public street naked. The competition is far from over, and who knows what other opportunities they may throw our way, but I think it’s pretty safe to say that it’s only reinforced my option that the ol’ fashioned submission and slush pile is the place for me to be. Competitions have always felt like publication detours, sometimes productive, sometimes not. They’re very much a gamble and because writing is so close to your heart it’s always painful if you don’t get the response you were hoping for, and it can take a while to pick yourself back up. Thanks to my fellow Minxes and everyone in blogland I feel like I’ve won this time. I now have a wonderful critique group and just hearing that someone read your chapter and genuinely liked it is the most amazing feeling in the world. I was also lucky enough to get some fabulous criticism from Heidi Rice so I’m definitely not walking away empty handed and I’d like to say a big THANK YOU to everyone for your support during the first stage of the competition and after. My greatest disappointment is not being able to get my hands on the rest of the stories that followed the fantastic first chapters I read. I tend to skim first paragraphs and chapters of books when I’m buying them and the best ones get stuck in my head and niggle at me to finish them. Needless to say, it’s driving me nuts not being able read the rest of those manuscripts. Next weekend I’ll have a wonderful distraction from those niggles because I’ll be at a Barbara Hannay workshop! 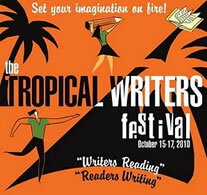 Barbara writes for Mills & Boon Sweet and will be at the Tropical Writer’s Festival on the 16th. If anyone fancies a nice, warm, tropical holiday you can find information on the workshop here. Submissions for Round 2 of NV have now closed and I'd like to wish Leah Ashton lots of luck with her entry! In the last three days I managed to kill both my desktop and laptop which I feel takes a special kind of talent, especially when the desktop is less than a year old…. I hope you'll all bear with me while I catch up on everyone’s posts. Of course it’s happened right in the middle of deadlines, which is always the way. Actually someone had a theory the more stressed you are the more likely you give off some sort of electro-magnetic field that can blow up the computer. While my computer was at the doctor’s Elissa Graham presented me with the “One Lovely Blog” award. Thanks Elissa! Because I’ve been out of action I’m not sure who has already received the “One Lovely Blog” award so for all of you who have yet to receive it please consider yourselves tagged! My computer has been sent to the doctor and I'm living on borrowed computer time while I type this so if I'm AWOL for a couple of days I promise it's not personal ;). For those of you with healthly, working technology who are eagerly waiting for your New Voices entry to be selected for critique or named in the special mid-week list pop over to the Minxes of Romance site for a special announcement!